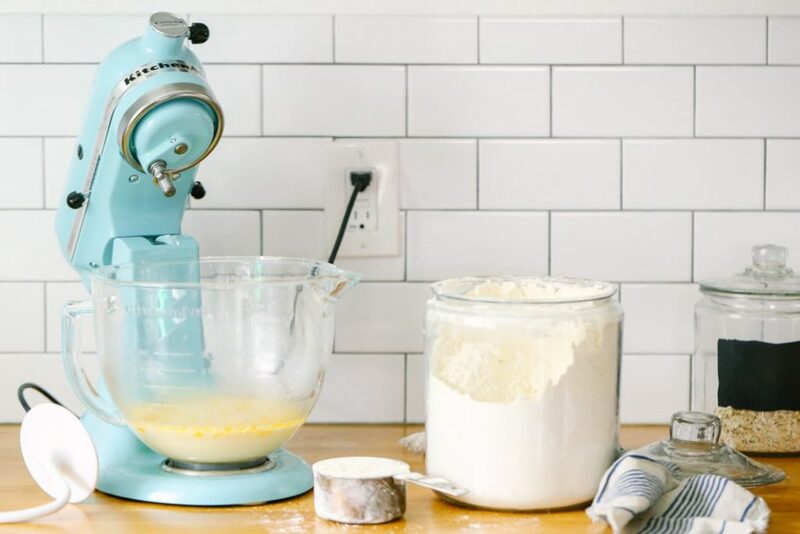 At first glance, this may not appear to be a big issue, but this vague description can really make or break a recipe, and no one wants a “broken” lemon bundt cake. What’s the big deal? From my baking experience, not all flours are created equal. One type of flour may need 2 eggs to create the perfect cake, while another flour may need 4 eggs to create the same cake. The same goes for liquid to flour ratios. 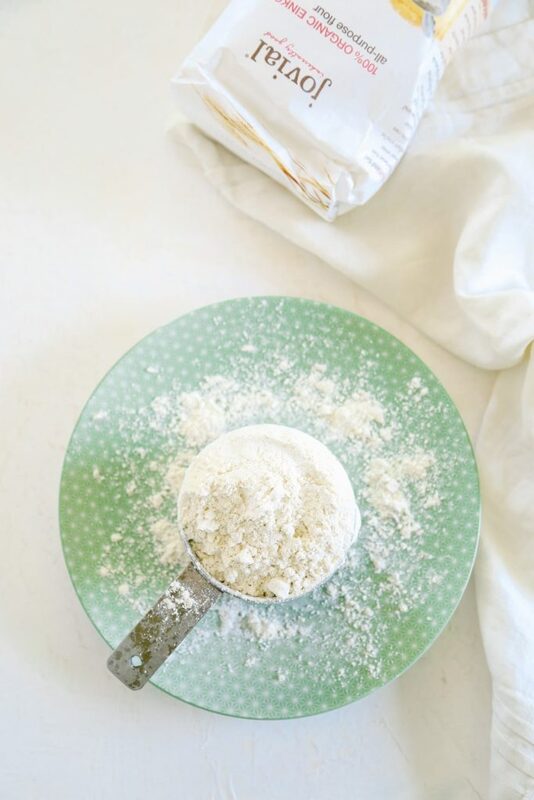 One flour may need 1 cup of liquid, while another may only need 1/2 cup of liquid. 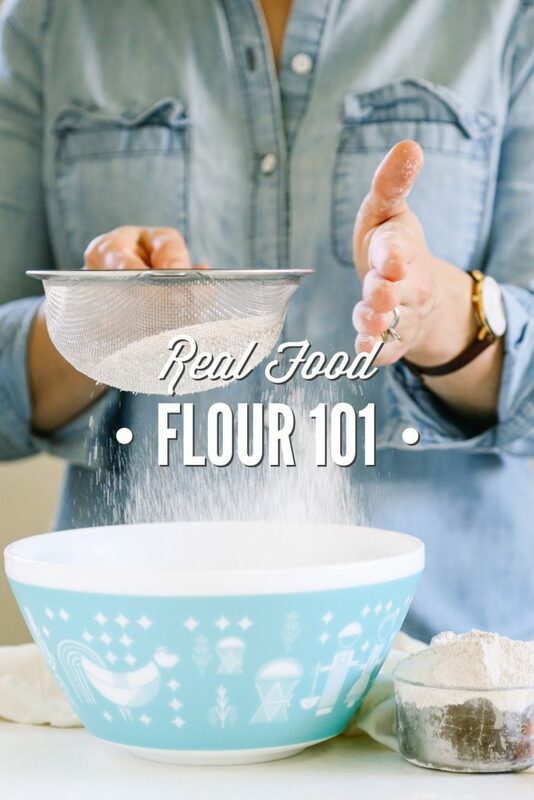 This means it’s important to know about the various types of flours, and how to use them in baking; especially since the world of healthier flour options is quite vast these days, ranging from wheat flour to ancient grains. 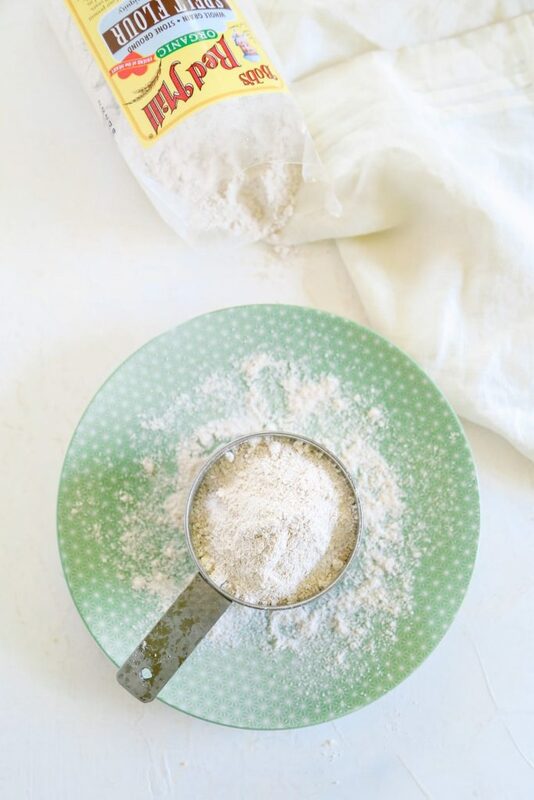 Today, let’s talk about the real food flour options I personally use in my kitchen. 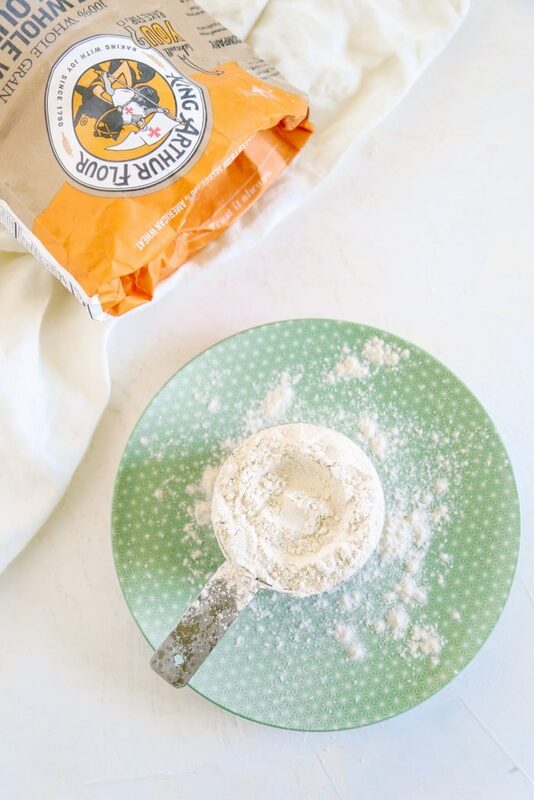 We’re not going to talk about gluten-free flours today, because I’m not a gluten-free baker (other than a few almond flour recipes we enjoy from time to time). 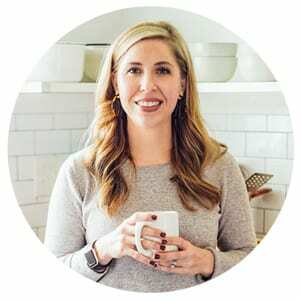 Renee, from Raising Generation Nourished, will be sharing her guide to gluten-free flour in the next few weeks. Einkorn is known as the oldest variety of wheat, making it an ancient grain. This ancient grain is believed to have originated in the Tigris-Euphrates region and is possibly the main grain referenced in the earliest accounts of the Bible. To put it simply, einkorn is the wheat men were eating in the earliest days before modern-day wheat varieties. While modern wheat has undergone hybridization, einkorn still holds true to its original properties. Einkorn is slowly gaining popularity, but is still grown in only a few regions in Europe. Einkorn slowly absorbs water and requires less working time and more rest time. I often refer to Jovial’s “Baking with Einkorn” page for tips on using einkorn flour in my favorite recipes. 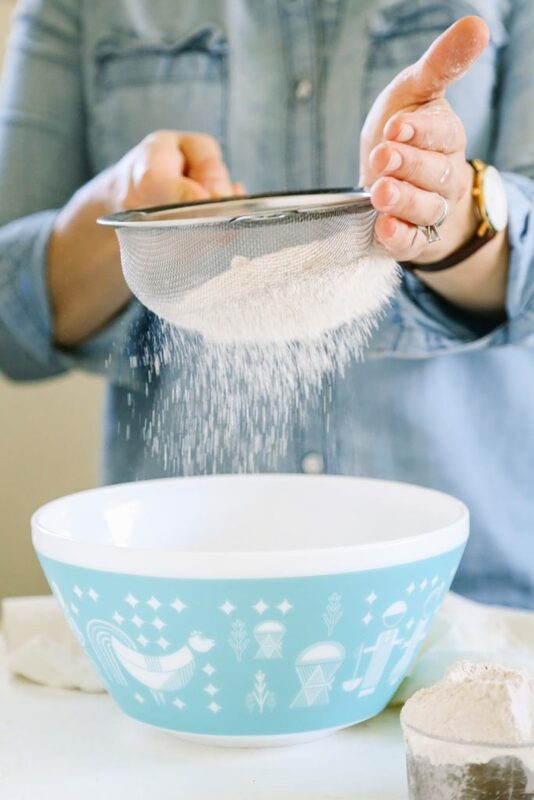 Jovial’s tips for increasing the eggs called for in cake-like recipes, kneading, and proofing yeast have helped me produce delicious baked goods countless times. When making the switch from all-purpose flour to whole grain flour, einkorn is my number one choice. Einkorn flour produces baked goods that closely resemble baked goods made with white flour: light, fluffy, and yellowish in color. Spelt is believed to have originated in the Near East over 8,000 years ago, eventually making its way into Europe, particularly Germany. The mildly-nutty tasting spelt berry is considered an ancient grain much like einkorn, and is even referenced in the Bible. The spelt berry has not been hybridized like modern-day whole wheat. Spelt has a lower gluten content than today’s whole wheat, making it easier to digest. Spelt is not gluten-free and should not be used by those with celiac disease or a severe gluten intolerance. Due to spelt being water soluble, more liquid is needed when converting a recipe to a spelt-based recipe. This simply means watching the dough or batter and adding a couple of extra tablespoons (or more) of liquid to prevent a dry baked good. When it comes to yeast breads, it’s important to take into account the low gluten content and more fragile characteristics of spelt. Spelt does not like to be over-mixed or over-kneaded. Over-working spelt (too much mixing or kneading) will result in a crumbly final product. Modern-day whole wheat is believed to have originated from the ancient emmer grain in the Fertile Crescent. Modern-day wheat, known as whole wheat, has undergone hybridization from its original form. The word hybridization may sound scary, but the fact is that much of our food today has been hybridized. Emmer’s hybridization resulted in a wide selection of whole grains. Whole wheat’s change is simply due to hybridization, not genetic modification. Whole wheat is wheat in its whole form, consisting of bran, germ, and endosperm. Hard red wheat (whole wheat flour) is best used for breads. Baked goods made with whole wheat flour have a slightly “earthy” taste and a dense texture. This little nugget of advice has been valuable for making delicious whole wheat cookies and bread countless times in my kitchen. I’ve also found that using half oat flour (which we’ll talk about later) and half whole wheat flour produces lighter muffins and quick breads. Just like whole wheat flour, white whole wheat flour is believed to have originated from the ancient emmer grain. White whole wheat was originally developed by cross-breeding red wheat, resulting in a different color kernel and a less “earthy” and bitter taste. White whole wheat flour produces baked goods that are fluffier than baked goods made with whole wheat flour. White whole wheat flour may be substituted 1:1 for all-purpose flour. This means it’s easy to convert just about any recipe into a real food, whole grain recipe using white wheat flour. Oat flour has quickly become one of my favorite flours to use in 2016 due to its nutty and sweet flavors. Oats, whether rolled oats or steel cut oats, originate from oat groats. Rolled oats, which is my preferred oat preference due to availability and cost, come from steaming and then flattening the groats. This process maintains the “wholeness” of the oat, so the nutrients remain intact. Technically, oats are gluten-free, but oats are only guaranteed to be gluten-free if they are processed on equipment that doesn’t touch gluten. 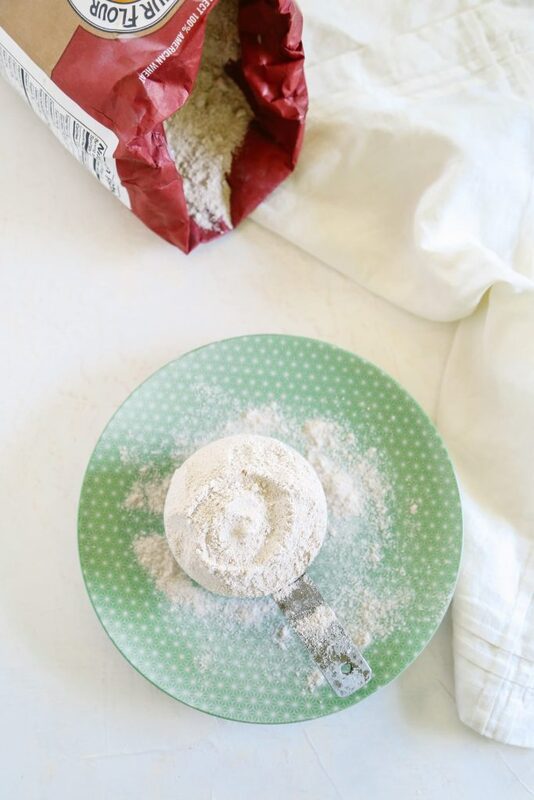 Oat flour may be purchased at health food stores, but there really isn’t a need to purchase special bags of oat flour since it’s super easy to make at home. 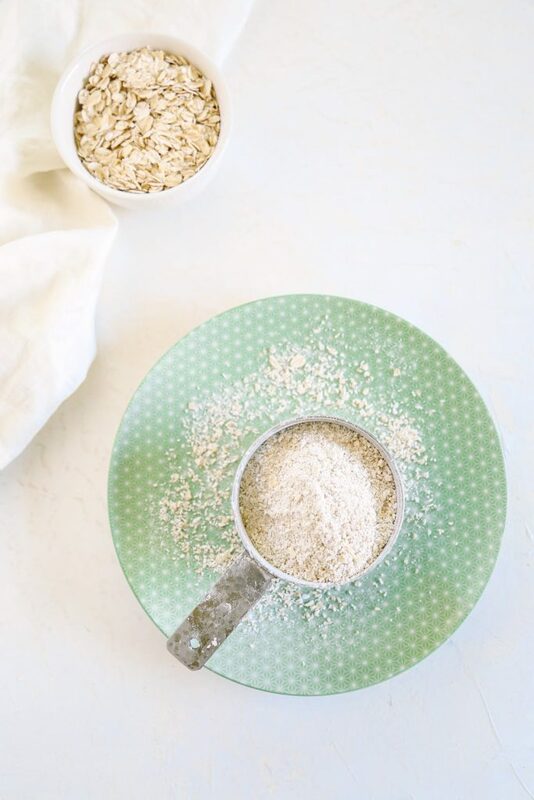 To make oat flour, simply grind old-fashioned rolled oats in a food processor until they turn into a flour consistency. That’s it! You can also make oat flour using steel cut oats or oat groats, but you’ll need a high-speed blender or grain mill. I love that oat flour, which is light and very absorbent, lightens heavier flours like whole wheat and spelt flour. If you’ve been following the blog for a few months now, you’ll remember these applesauce muffins and these morning glory muffins. Both recipes use oat flour to add a light texture and sweet flavor to the wheat-based muffins. I also love to use oat flour to make scones, pancakes, and cookies. Sprouted flour is essentially flour that’s made from sprouted grains. Sprouted flour is considered more digestable since the sprouting takes the flour from just a grain to a living plant. I used sprouted whole wheat flour for about a year, after making the switch to real food, but I couldn’t get over how dense my baked goods always turned out, and the hefty price or time involved to make my own sprouted flour wasn’t ideal. Kamut is another ancient whole grain, which originated from ancient Egypt. I personally don’t have much experience with kamut. From my very limited experience, this flour reminds me of a corn meal versus a wheat-like flour. Whole wheat pastry flour is a whole wheat flour that includes the germ, endosperm, and bran, but with a lighter taste and texture than whole wheat flour. Whole wheat pastry flour is made from soft white wheat berries that are ground for baking, resulting in a whole grain that’s light and fluffy and lacks the dense quality produced by whole wheat flour. I don’t use whole wheat pastry flour very often these days thanks to my discovery of einkorn flour. Very interesting. I have recently tried einkorn but am having trouble with measurements. I know that I need less liquid but I’m still having trouble with ratios. Wondering if I should measure by weight since I’m grinding my own and it hasn’t “settled” yet when I measure it. Any idea what 1 cup of einkorn should weigh? Hey Geri, Yes, I think weighing the flour is going to be the best when using freshly milled einkorn. Technically, weighing four is the most accurate way to bake, so I’ve been thinking about adding weight along with volume measurements to my baking recipes in the future. I’m not sure what a cup of einkorn weighs, but I’ll check this afternoon and get back with you. Kristin, I planned to look up einkorn flour today – you really answered my question – & then some! So excited to try it. Have you looked into milling your own flour in your quest for real food? Hey Kelly, Yes, I used to mill my own flour, but decided that purchasing it ground was better for our family in this season of life. I still own my grain mill, so I may return to grinding my own flour in the future. In the last year we made the switch to home-milled flour after realizing that what we thought was gluten intolerance in my son is actually a sensitivity to the pesticide they are spraying the wheat heads with in the field, a process called dessication. We now eat homemade sourdough bread made from home milled organic flour. It has changed our lives. We are now rarely sick (and since this was our oldest’s first school year, that’s saying something.) Everyone’s gut is happier too. What is interesting is that store bought flour has lots of nutrients removed in order to make it shelf-stable. Once wheat is ground it loses 40% of it’s nutrients in 24 hours, so by mailing your own, your family really gets all the health benefits and antioxidants of this wonderful grain. If you are interested in learning more I highly recommend getting a copy of Susan Beckers lectures of the Bread Beckers out of Georgia. Hey SnowWhite, Thank you for sharing. I’m so glad you’re enjoying milling your flour–it’s such a great experience with amazing health benefits. I’m very familiar with Bread Beckers and have their book–love them! The health of my family has changed drastically since I began milling our flour and making real bread at home. We too have been blessed immensely by the Bread Beckers. 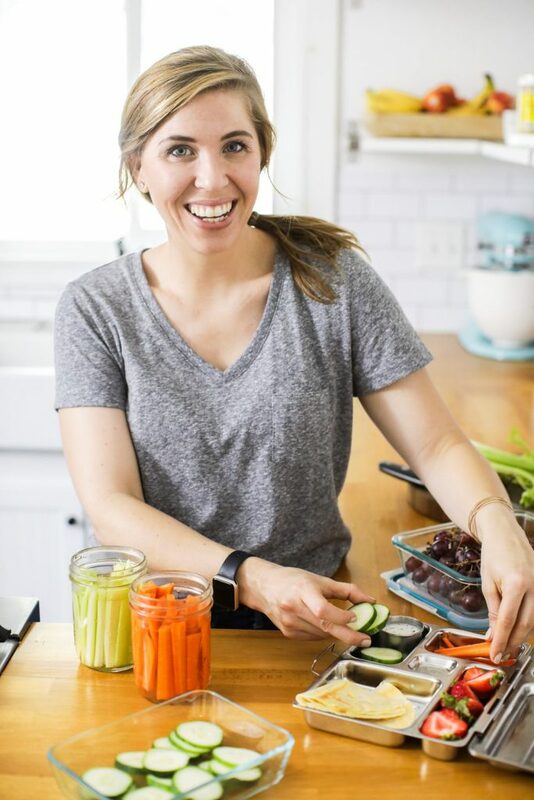 Thanks Kristin for all the info presented in this post and for all the healthy living info presented on your website. I have learned so much from you and now am able to make many of my own cleaning products and beauty products at home for my family. I also use many of your recipes. Thanks for all you do! Sorry, that was supposed to be “milling your own”!